While serving on active duty, members of the military are typically asked to move every few years and must learn how to manage money during multiple deployments. And managing the finances means figuring out a way to maintain a balanced budget while communication is limited. Meanwhile, the spouse at home is essentially functioning as a single parent without the necessary skills and tools to make serving as the family’s Chief Financial Officer as easy as possible. That is, until now. Jean Chatzky, financial editor for NBC's TODAY show, is here to help with Operation Money, a mission-based guide that provides detailed resources to prevent money problems before they happen; gives you the tools to manage through a tough situation if you’re already facing one; and empowers you to figure out how best to plan for your future—either in or out of the military—and then assists you in doing so. The chapters throughout focus on saving, debt, credit, buying and financing a home, buying and financing a car, paying for college, protecting the ones you love with insurance and an estate plan, dealing with a relocation, managing money through a deployment, handling a furlough, retirement, divorce, and the financial aspects of caregiving. 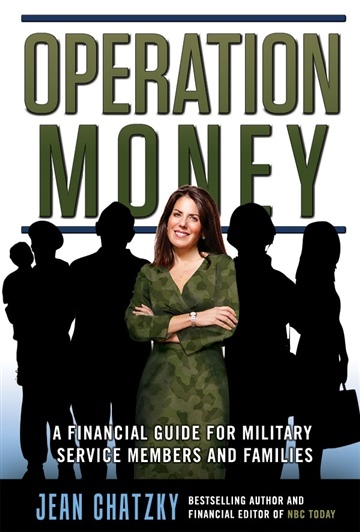 With contributions from Blue Star Families, MSCNN, and other military related organizations,Operation Money is a must-read for those who serve that are looking to take charge of their financial present and future. Operation Money is published and available free-of-charge thanks to the generous support of Citi. For more information on Citi’s support for military veterans and their families, visit www.citisalutes.com. Jean Chatzky, the financial editor for NBC’s TODAY show, is an award-winning personal finance journalist, AARP’s personal finance ambassador and an educational partner for Fidelity. Jean is a best-selling author; her most recent books are Operation Money, a free financial guide for military service members and families; and Money Rules: The Simple Path to Lifelong Security. She believes knowing how to manage our money is one of the most important life skills for people at every age and has made it her mission to help simplify money matters, increasing financial literacy both now and for the future. In 2015, Jean teamed up with Time for Kids and The PwC Charitable Foundation to launch Your $, a financial literacy magazine reaching 2 million schoolchildren each month. She lives with her family in Westchester County, New York.